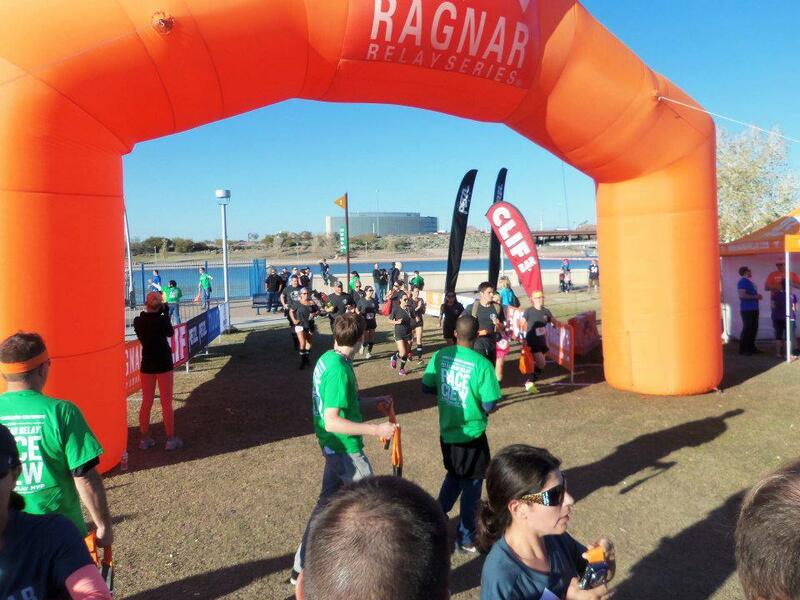 My first Ragnar relay, Feb. 22-23, was an unforgettable experience that pushed me to my limits and gave me an unrivaled sense of accomplishment. 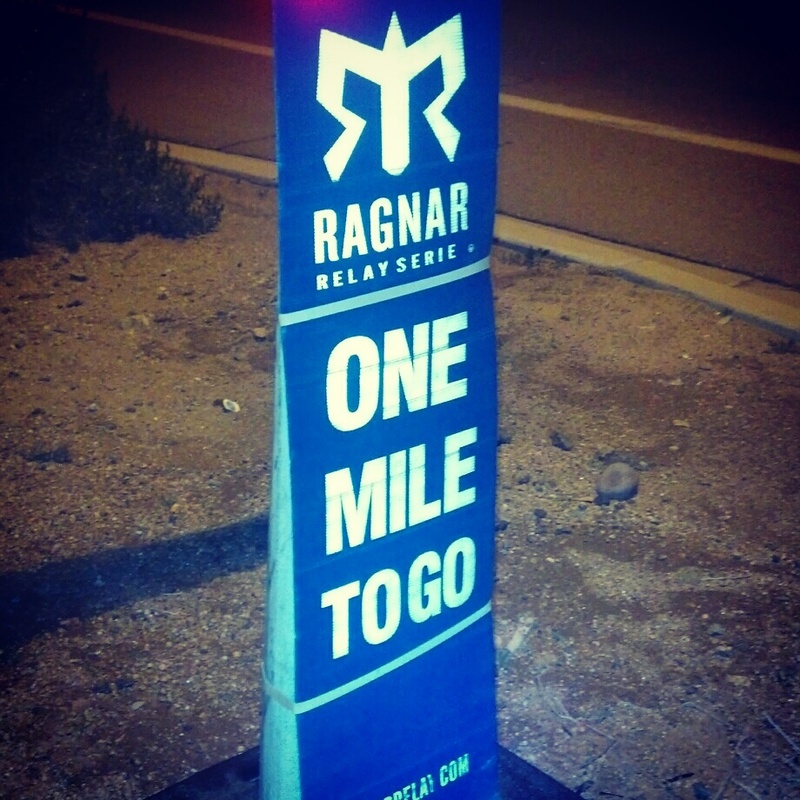 Ragnar is a 12-person, 200 mile relay race, with courses around the country. 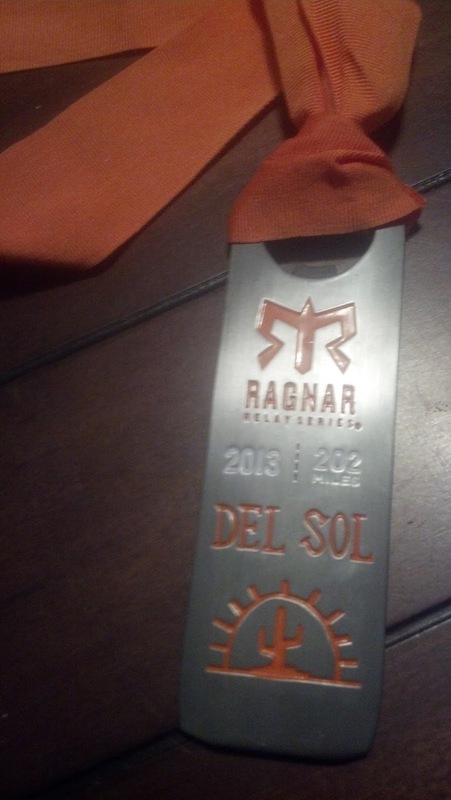 My nerves didn’t let me get a wink of sleep the night before Ragnar Del Sol. Our team had met to decorate our vans and pack some of our stuff. I came home and finished preparing, checking off items on my packing list. I feared I was bringing too much, and I probably did, in retrospect. I was in Van 1, which had a 7 a.m. start time. We agreed that I would get picked up around 4:50 a.m. to give us enough time to make the drive from Phoenix to the starting line in Wickenburg. My alarm was set for 3:50, but I got out of bed much earlier. As we approached the starting point, my excitement intensified. White 12-person vans decorated with window paint, firefighter helmets, doughnuts, Christmas lights, and even bras rolled past us and filled the parking lot at the start site. I then realized how big the race was. What I wasn’t prepared for was 32-degree weather in Wickenburg. I wished I had brought along comfortable boots to wear when I wasn’t running. Drinking tea and wearing long socks warmed me up a bit. Once our first runner jetted off, though, time seemed to fly by. I nervously awaited the arrival of my teammate. Within the first mile and a half I took off my top shirt, sleeves and headband and handed them to my teammates when they stopped to give me water. It was my only van-supported leg of the relay. In no time it was my turn. The first lesson I learned: Don’t wear too many layers. The temperature during my first leg was in the 60s, but it felt like 90s. I appreciated that my team and other vans cheered as I ran past them along my 6.7 miles. I was grateful to be done with my first 6.7 miles. I relaxed a bit after my first leg, as I then knew what to expect. My team met Van 2 at Exchange 6, where we chatted for bit before driving to Willow Canyon High School in Surprise, the site of Exchange 12. There we devoured our snacks and attempted to get some sleep. I laid out my sleeping bag on a patch of grass next to the school’s fields with two of my teammates. The other three rested and talked in the van. 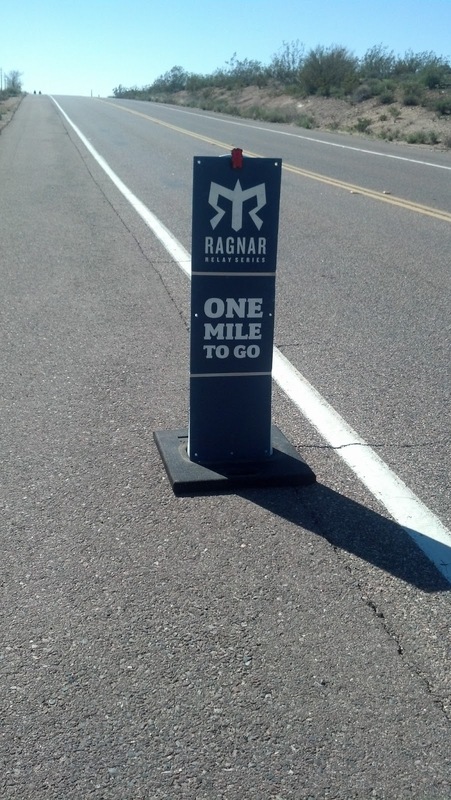 Most other teams slept on the football field or took advantage of the Ragnar services. I’d guess I got 30 minutes of rest. I soon gave up trying to sleep and took advantage of the locker rooms to change into my night-run clothes and brush my teeth. Time again seemed to race ahead. Soon sunset arrived and it was time to exchange again. Again we briefly mingled with Van 2 and began our night legs. I wish I had taken more photos, but the darkness and sleepiness got in the way. Before I knew it my turn came up again — this time at about 1 a.m. My second leg, Leg 17, made me the most nervous because it started by crossing a pedestrian bridge over Interstate 17 and continued along a difficult-to-locate desert trail. For the first few yards I had only a vague idea in which direction to run. I looked out into the darkness trying to spot any markers, and the runner in front of me stopped to ask if I knew where to go. Another runner soon arrived and somehow spotted a runner’s LED back light in the distance. We sprinted off in that direction and soon the trail became more clear. It was unsettling that in two spots we hopped over small fence barriers (at one of them a volunteer reassured us that was the correct thing to do as I asked, “What is this?!”). 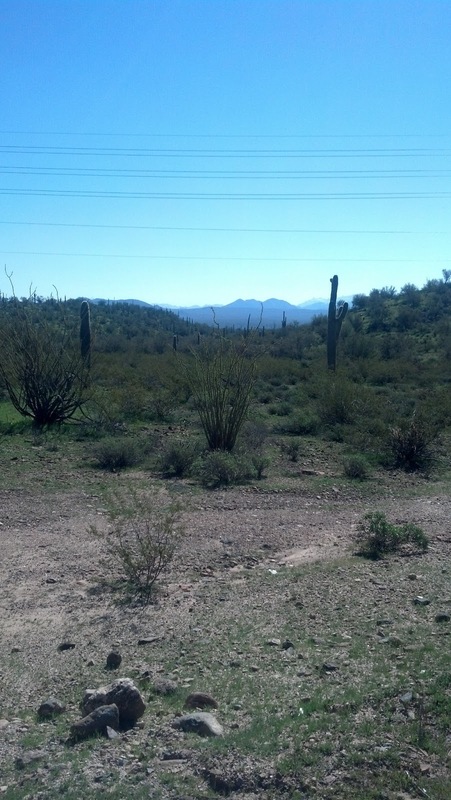 I was relieved to be back on a paved north Phoenix road within a mile or so. The rest of the 5.6-mile felt exhilarating. The temperature felt just right, and I liked not being crowded by other runners. In some spots I was the only runner when I looked around. That’s not to say I didn’t come across runners as I ran through the quiet neighborhood. I even passed four others, my first “kills.” The leg was unsupported, but a water station was provided and police officers stood watch in a couple of spots. I never felt unsafe. I finished at about 2 a.m. feeling reinvigorated and proud. 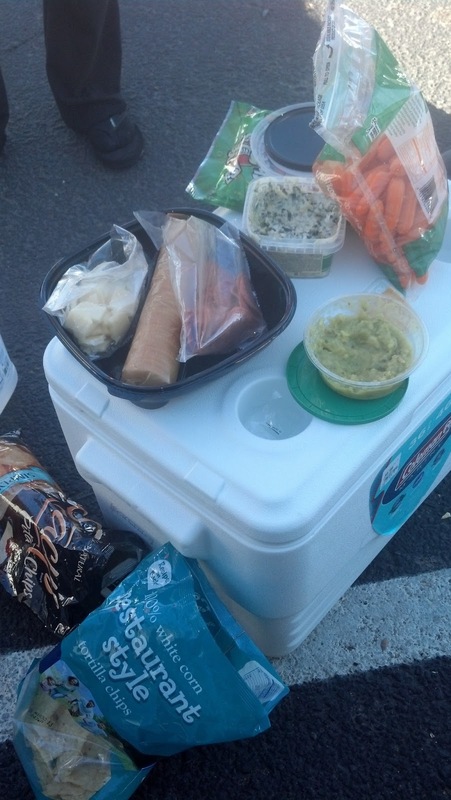 When our last runner finished her second leg, it was time to eat and try to sleep. The six of us managed a tiny bit of sleep in the van, I’d say less than an hour for me, as we waited for our next exchange in Cave Creek. Our first runner took off just after sunrise, and I was jealous of the gorgeous views he’d get to soak in. Our van was tagged many times by other teams. Tagging, or marking on vans, was a fun part of Ragnar. Some teams had magnets, too. Runners wait to start their next leg in the Rio Verde area. View of Four Peaks from one of the exchanges. Vans and vans and vans and more vans. My final leg came at about 11 a.m. I was grateful that one of my teammates, a Ragnar veteran, warned me of the hills I would encounter. I tackled them one step at a time, not rushing to finish. I allowed myself to walk for a few seconds on two of them when it felt too intense. I also stopped to take some photos and enjoy the scenery. I noticed that a few other runners were struggling, and we exchanged a “good job” as we passed each other. 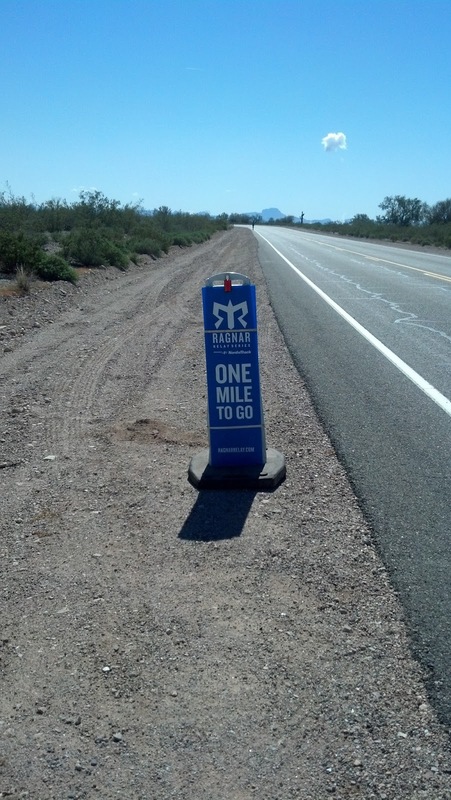 Finally the 1-mile marker came into view, and I almost leaped for joy, though at this point my muscles were tight despite stretching, foam-rolling and applying Icy Hot. I was incredibly proud to have finished my 17 miles and on a steady pace. After our last runner’s final leg, it was finally time to exchange again and venture to Tempe Town Lake to wait on Van 2. I indulged in free pizza, chips, Clif Bars, crackers, cheese, anything I could get my hands on. A few short hours later, it felt amazing to run across the finish line with my teammates. I will carry the experience with me and can’t wait for my next running adventure. My reward for 17 miles.